Exceptional landscape design Charleston SC means creating sunsets on the water, patio dining, fragrant gardens and soothing water features. Your landscaping ideas – play, relax, dine and celebrate with friends & family. Our Charleston landscape designers create outdoor living spaces one room at a time! 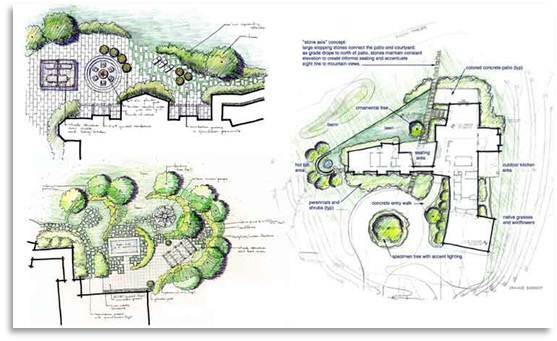 The first step in our Charleston landscape design plan is a consultation to understand your landscaping ideas. During your consultation, our landscape designer will perform a site survey to determine the ideal locations for gardens, beds, trees, shrubs, hedges, sod, pathways and water features. The second step in our Charleston landscape design plan includes personalized nursery tours for customers to view tree, shrub and flower selections. Our landscape designer will assess soil conditions for different areas in the Lowcountry such as downtown Charleston, Mount Pleasant or Daniel Island. Our landscape designer will assist you with selecting the optimum plants for your landscape conditions based on shade, sun, soil and drainage. Amazing landscape design Charleston SC is a perfect selection of plants that blend texture, size, color and fragrance. The final step in our Charleston landscape design plan includes our landscape designer reviewing the landscape design plan with you by painting or marking each area of your yard and performing a customer walk through. Prior to starting your new Charleston Landscaping plan we attain permits, zoning approvals and coordinate with utility companies to mark power, phone and cable lines. A new service, we offer landscape design Charleston SC plans as a consultation fee for customers looking to do the work themselves. Let us turn your landscaping ideas into a professional Charleston landscaping plan! Call (843) 579-1033 or email info@charlestonplantworks.com to schedule a landscape design consultation. "I love my new yard and have been spending much more time on the porch since Charleston Plantworks finished up a few weeks ago. They added privacy along both sides of my back yard, new sod, and replaced many of the ugly plants my builder had installed. They really worked hard to make sure my husband and I were satisfied and even stopped by after I paid them to make sure everything still looks good. Great customer service."